The Dumpster Renters are dedicated to delivering Franklin residents the best customer service and dumpster rental experience. We are located in Walpole and the owners are residents of Norfolk. Our close location makes The Dumpster Renters the best choice for Franklin dumpster rentals. From dumpster delivery to pickup, Franklin residents can rely on The Dumpster Renters for the best service in the business. Our goal is to provide the best customer service, making sure all your questions are addressed for the duration of your dumpster rental. The 10 yard dumpster is the smallest dumpster we rent in Franklin. Used for small cleanouts, small roofs and bathroom remodels. For smaller load consider using a full service junk removal company. 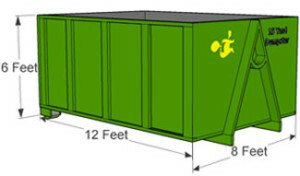 The 20 yard dumpster is good for large cleanouts, whole house remodeling projects and additions. 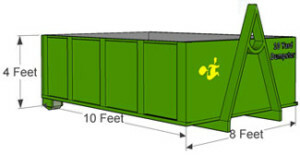 It is the most common dumpster we rent for both homeowners and contractors. Same day delivery maybe available for Franklin dumpster rentals.